Kate Potter used to love Christmas. A few years ago she would have been wrapping her presents in September and baking mince pies on Halloween, counting down to the countdown to Christmas. But a few years ago, everything was different. That was before Kate’s husband went away with the army and didn’t come home. Now she can hardly stand December at all. Kate’s lonely. She doesn’t think she’s ready for romance, but she needs more than this, and her son Jack needs a Christmas to remember. What Kate needs is a Christmas miracle, and if there isn’t one on its way, she’ll just have to make her own. So begins Kate’s advent countdown to the best Christmas ever. The festive, brightly jolly cover betrays the novel that as held within. For while I was expecting a sweet, romantic novel; what I ended up reading was a book that I couldn’t help but draw comparisons to A Christmas Carol. Alexander manages to capture that trials and tribulations for those that are struggling to make ends meet, while trying to capture the Christmas spirit for their child. Though this may seem like less than a festive read, there is much in this book that captures the true meaning of Christmas, at least for me. While life throws Jess many curve-balls, not just during the events of the book, Kate has a number of people in her inner-circle that are there to help her during these tough times. This is what is so inspiring about this book, that people even in the darkest of times, will try to help others. From issues with Jacks school, to the threat of her losing her job after Christmas, her close friends and colleagues pull together to help her overcome these obstacles. 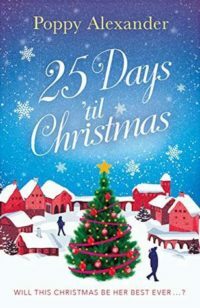 Underneath this story line, there is a blossoming attraction between Kate and Daniel, a guy that Kate saw the previous years she was selling Christmas Tree’s outside the store she walked. Daniel is also finding this Christmas difficult after suffering his own loss this year. There are so many near misses in this book between Kate and Jack, and each time I kept willing one or the other to take that leap, but as I grew to know each character I could see why it was so difficult to take that last leap of faith. Yet, it didn’t diminish my hope. However, near the end of the book, when things took a particular dark turn and I began to fear that this would not be the happy ending I hoped. It is really easy to get behind Kate for she is a character that you sympathise and root for. That is not to say that she is without flaws, but you want the best for both her and Jack. You can really tell that she finds this time of year difficult, especially with the fact that her hands are tied due to the financial strain she is under preventing her from giving Jack the best Christmas ever. However, when her son’s well being is under threat, you really do see the momma bear tendencies come to light. When this happened, my I was there behind her, rooting her on and willing her to fight. As for Daniel, I never got a full picture of him. Yes, he does seem the white night of the book, but Alexander refrains from going down the route of him solving all of Kates problems. Yes, he does provide her with some opportunities, but it isn’t a magic band aid to all Kates problems and she still has a choice. The book ends on a message of hope and better things to come. This does not necessarily mean a happy ever after, but it is the first step in a brighter future for Kate, Jack and Daniel. 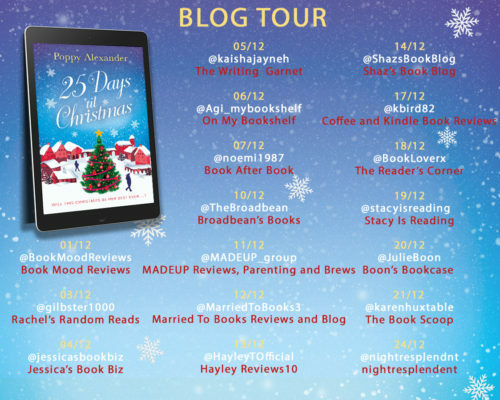 25 Days Til Christmas proved to be a book that truly showcases all the different aspects of Christmas and when I finished it, I was left with a warm feeling inside. Yes, this wasn’t the Christmas Romance I expected, but it none the less was an enjoyable book.